"If anyone here present, knows of a reason...oh COME ON, SOMEONE!" "At the weekend, I got Spliced..."
This reminds me so much of my old marriage, I was left, she was always right. If you are that much intersex, then why get married? Poor Sandra is going through the change. "...bless us, Father, for we have sinned." 🎵 Here comes the bride - ten inches wide. Shorter than a traditional wedding service, the Bride had removed half of the hymns. He's not post oops yet. To date, this has got to be the most half-assed episode of Don't Tell The Bride. Ever since she was a child, Alison had suffered an irrational fear of being jilted at the altar. Dave really fancied himself but just couldn't get around to it. Now we know what happened to the bridesmaids in the previous photo. Although Ella was sixteen and seemed happy, the police suspected grooming may have been involved. "Poor Charlie. He's half the man he used to be." 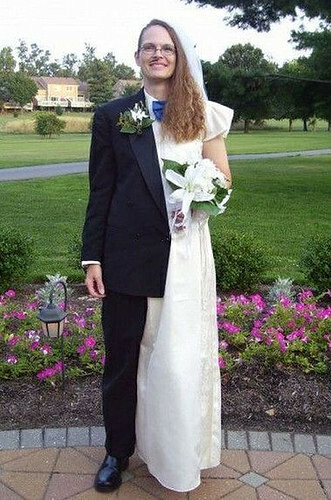 Maureen was worried how her split personality wedding would go .But on the day she was besides herself. Let’s just hope and pray they never split up, my divorce was painful enough! No wonder the bridesmaids got their knickers in a twist!